Researchers have finally have scientific proof live poultry markets are a breeding ground for bird flu. Grocery shopping abroad can be exciting. This is especially true for expats living in countries where open-air markets are common. But while heaps of fresh food may be a welcome change from the supermarket, they can also carry health risks–particularly if they have feathers. A new study has definitively linked live poultry markets in China to outbreaks of avian influenza (aka “bird flu” or H5N1 if you want to be scientific about it). Researchers from the American Institute of Microbiology went to poultry markets bird flu patients visited before getting sick, collecting nearly 70 samples from ditches, cages and water. They eventually isolated 12 different bird flu strains from 4 poultry markets. 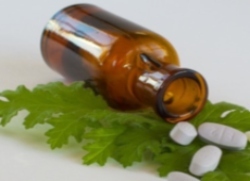 Analysis showed these were 99% similar to strains found in human infections. The scientists also analyzed bird flu strains from 38 human cases over the past 5 years. 31 of these matched flu strains found in live poultry markets. Enhanced infection control measures are warranted in these markets, not only to reduce human H5N1 infection, but also to minimize the likelihood of coinfection with H5N1 and 2009 H1N1 viruses. He explained that if many patients came down with both bird flu and H1N1 “swine flu” at the same time (a process called coinfection), the chance of a deadly worldwide pandemic would increase dramatically. That’s because the virus would have a better chance of mutating into a highly contagious strain. Back in November a case involving both bird and swine flu was found in Cambodia, though fortunately we were spared a flu apocalypse at the time. 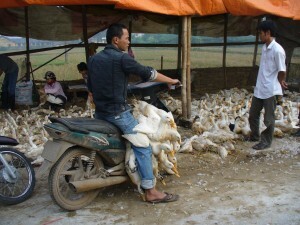 Live poultry markets are common not only in China but throughout southeast Asia, including countries like Vietnam and Thailand. To be safe, expats should always practice good hygiene when visiting a local market. After visiting a market, make sure to wash your hands thoroughly with soap before eating or drinking. You should also avoid local dishes that use bird blood as a key ingredient.